A SURVIVING ORIGINAL VINTAGE 1950'S PARK CENTER CHAIR! We need better photos of the Park Center! We are going to be adding to this section over time. If you have photos of Charlotte Park Center (Grady Cole Center), especially from "back in the day" feel free to send them and if we can, we will use them here. Front Entrance Today, facing N. Kings Drive. Where The Park Center/Grady Cole Center now stands was originally the National Guard Armory. It burned in about 1954. Jim Crockett Sr. ran many of his his wrestling events at that armory. 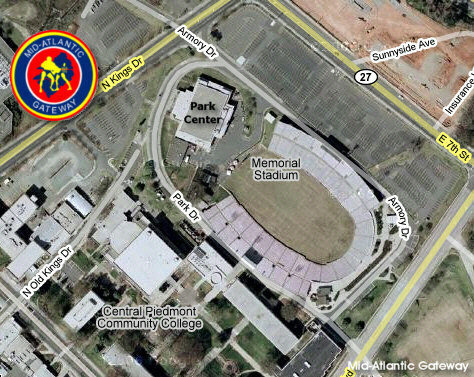 The Charlotte Park Center/Grady Cole Center is under the management of the Charlotte Parks And Recreation Department. In the early to mid 2000s, the city of Charlotte and Mecklenburg County combined there efforts and its now called Mecklenburg County Parks And Recreations Department. "At first glance, Grady Cole Center looks like a glorified basketball court--and that's pretty much what it is. But it's not only the building, but what goes on there, that makes Grady Cole special. Located in the historic Elizabeth district, the center presents a wide variety of events, from the common local high school and college basketball games to the more pleasantly unexpected music of Ani DiFranco. You might even open the door on a collection of regional church youth sharing some Christian rock. Make the minutes-long trip from Uptown to check out the current offerings." What? No mention of Jim Crockett Promotions Mid-Atlantic Championship Wrestling every Monday night at the old Park Center? They have no appreciation for the real history of that building! 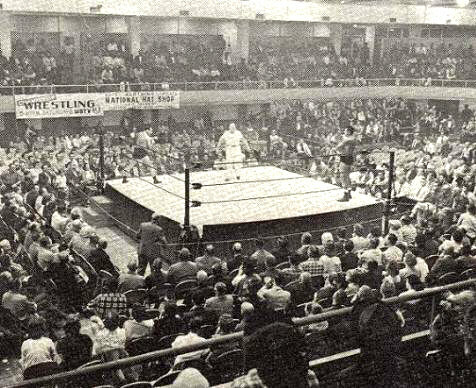 The sold-out Charlotte Park Center on Monday night, July 22, 1968. 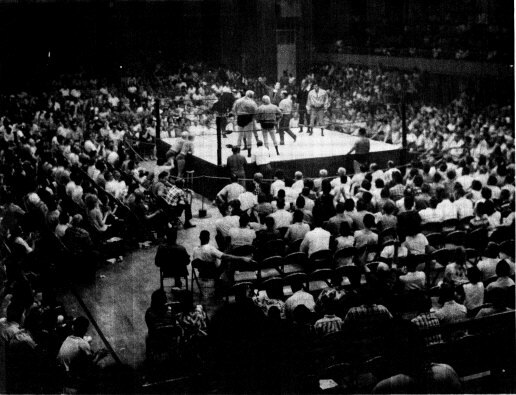 In the ring are Rip Hawk, Swede Hanson, and Sailor Art Thomas preparing to battle George Harris, Bronko Lubich and Aldo Bogni in a six man tag team match. 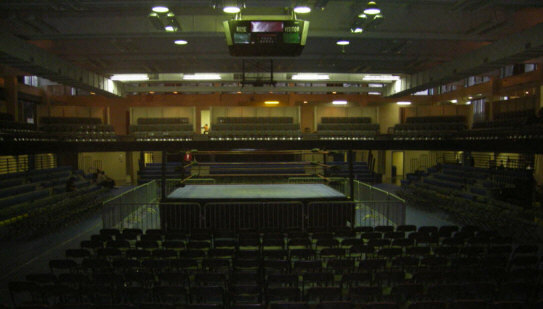 The interior of the Park Center (Grady Cole) today set up for a wrestling show later that night. 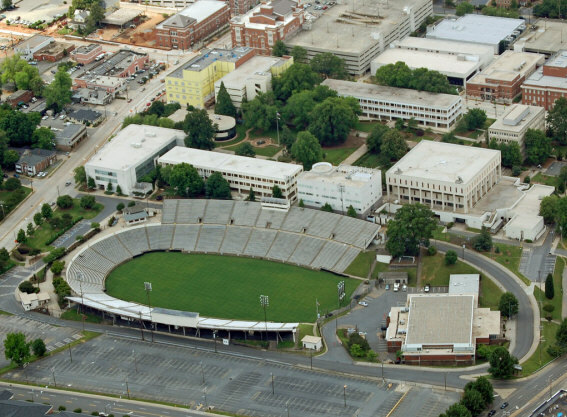 War Memorial Stadium sits adjacent to the Park Center/Grady Cole Center. 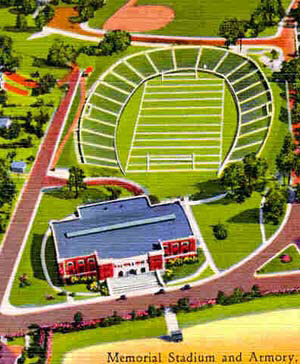 The Park Center (now known as the Grady Cole Center) sits at the open end of Memorial Stadium, with the skyline of Charlotte in the background. as they looked circa early 1950s. Thanks to Barry Caldwell who submitted this image and information. A peek inside Memorial Stadium today, through the east gate. You can see the old press box sitting at top of the grand stand. 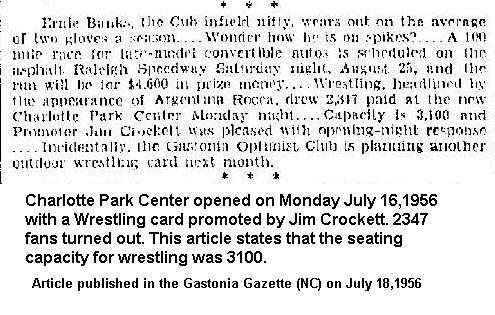 One of the most impressive cards in Jim Crockett’s 23 years as Charlotte’s wrestling promoter has been booked for the reopening of the mat game here tonight. 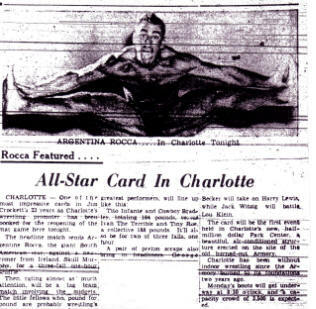 The headline match sends Argentina Rocca, the giant South American star, against a newcomer from Ireland, Skull Murphy, for a three-fall, one hour scuffle. Tito Infante and Cowboy Bradley, totaling 184 pounds, versus Ivan the Terrible and Tiny Roe, a collectively 188 pounds. It’ll also be for two of three falls, one hour. A pair of prelim scraps also bring in headliners: George Becker will take on Harry Lewis while Jack Witzig will battle Lou Klein. The card will be the first event held in Charlotte’s new, half million dollar Park Center, a beautiful, air-conditioned structure erected on the site of the old burned-out Armory. Charlotte has been without indoor wrestling since the Armory burned to its foundation two years ago. Monday’s bouts will get underway at 8:30 o’clock and a capacity crowd of 3,500 is expected.